Astypalea island in Greece. Livadia. Pera Gialos. Chora. Accommodation. Ferries. 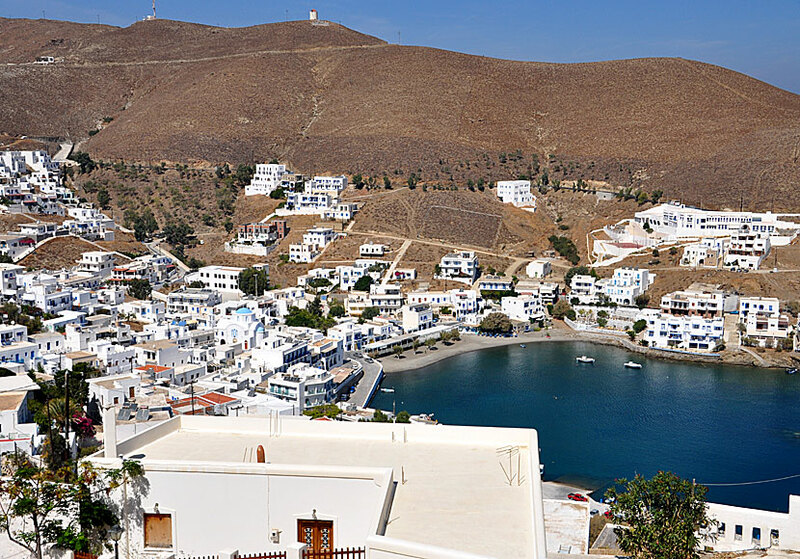 Astypalea (or Astypalaia) belongs to the Dodecanese islands and it lies a little to itself between Amorgos and Rhodes. It is a relatively small island both to the area and number of residents. Here live about 1,335 people in two villages, and some small communities. The capital is Chora, and the biggest tourist resort is Livadia. The surface is 96 km2 and the highest mountain - Vardia - measuring 482 meters above sea level. The windmills in beautiful Chora in Astypalea. 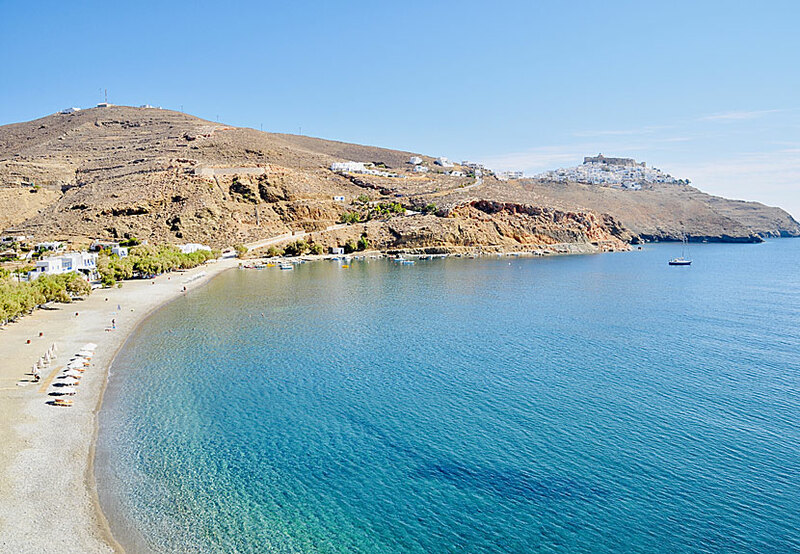 For many, Astypalea is an island to move into low gear, calm reigns here, you have a lazy time at Livadia beach during the day and you sit for hours at a taverna in the evenings. The most tavernas are in Pera Gialos, many of them overlook the sea. 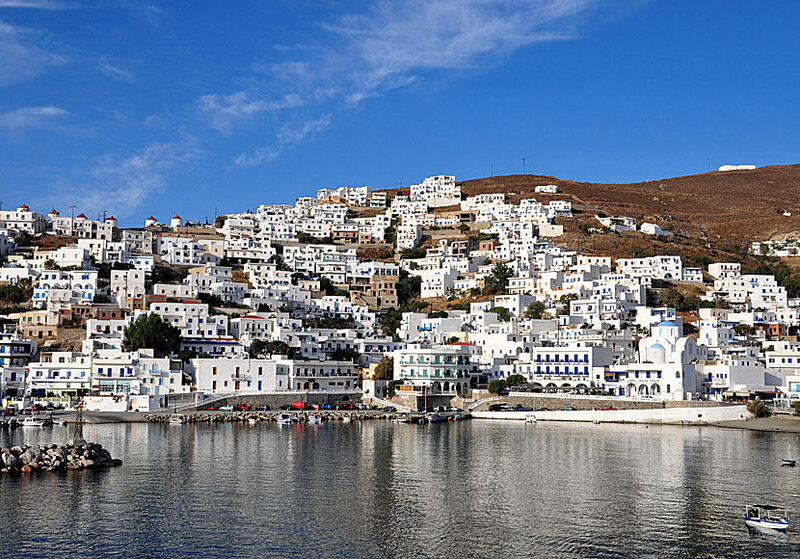 If the boat connections had been better, Astypalea would probably be visited by more tourists who like small islands. Good for fans of quiet islands, bad for the locals who want more tourists. 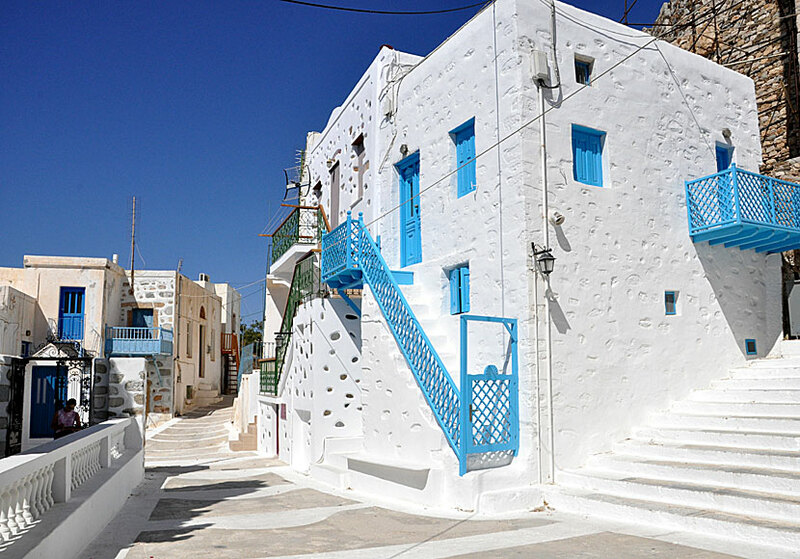 The architecture of Astypalea is typical Cycladic. The easiest way is to fly to Athens and continue with domestic flights directly to Astypalea, or by ferry from Piraeus, the port of Athens. Expect at least nine hours by boat. Another option is to go by air to Kos, take a ferry to Kalymnos and from there continue to Astypalea. 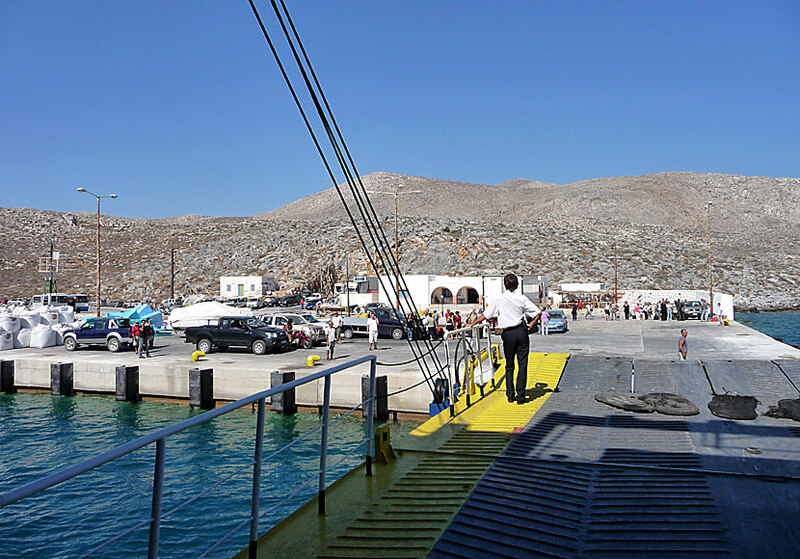 The small ferryboat Nisos Kalymnos runs between Kalymnos and Astypalea three times a week. You can also go with Blue Star Ferries from Amorgos and Paros. Nisos Kalymnos call at the port of Pera Gialos, and the big ferries from the boat company Blue Star Ferries dock at the port in Agios Andreas, located 7 kilometers north of Pera Gialos. Public bus runs from and to the port in connection with the ferries departure and arrival. Local bus runs to and from the port in connection with the boats departure and arrival (which usually occurs in the middle of the night.) The port of Agios Andreas is nothing more than a port. There is a coffee shop, nothing else. A rather boring place if you ask me. Link to a rerry timetable is at the bottom of the page. The boring port of Agios Andreas. Buses start out from Pera Gialos and operate Chora, Livadia and Maltezana. Car and moped rental companies are located in Pera Gialos and along the way to Livadia. As a rule you principally move between Pera Gialos, Chora and Livadia and the distances are not longer than one can walk. Beach boats to the beaches Vatses and Kaminakia goes from Pera Gialos in high season. 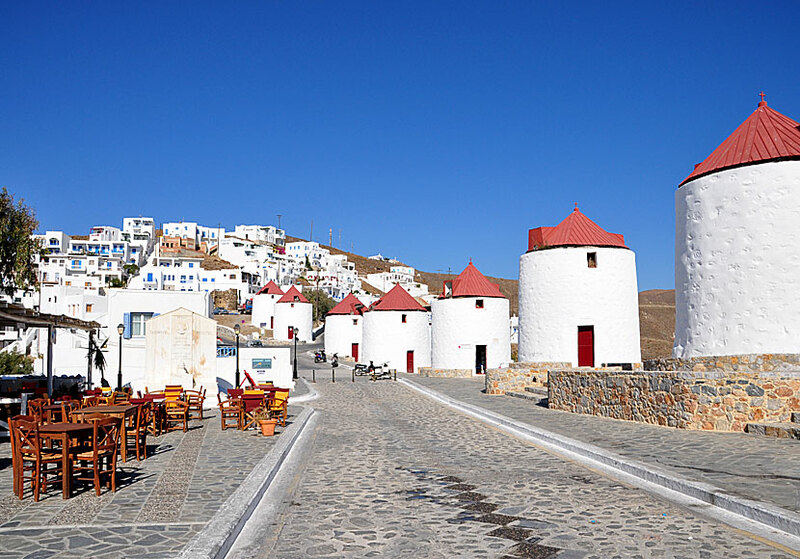 Pera Gialos and Chora are the two largest villages on Astypalea, in addition there are a couple of hamlets as well. Pera Gialos is the big port on Astypalea, but there are no longer any large ferries that call at the port. When the new port on the other side of the island was opened the village changed name to Pera Gialos, formerly the village was named Skala. The sunset from Pera Gialos is magical. View of Pera Gialos from Kastro. Pera Gialos and Chora are built together, where one village begins and ends is impossible to see. The villages are connected by a very long staircase that truly takes on the strength. In Pera Gialos there are pensions, travel agencies, banks, shops and several tavernas and ouzerias. There is also a small beach where it's okay to bathe now when the large ferries are gone. Chora (see photo at the top of the page) is one of the most beautifully situated villages throughout the Greek islands. The village is dominated by a magnificent fortress, which is like a sugar loaf above the village. The architecture of Chora is Cycladic: whitewashed houses and many narrow alleys. By the windmills there are a square with tavernas, ouzerias and cafes. There is a road between Pera Gialos and Chora, you can also walk the long steep hill. Chora and Pera Gialos in Astypalea. Maltezana is a small sleepy village with a decent beach and a nice taverna. No village that you choose to stay for the night, but the taverna is worth a visit for lunch. Nearby are remains of a Byzantine baths. Exo Vathy is a tiny village with a tiny port as far north as you can get. The hamlet is located in a protected bay where fishing boats anchor in bad weather. There is not much to see and it is quite far to go, but the taverna by the waterfront and the soothing atmosphere is reward enough for the long journey. A small beach is nearby for those wishing to take a dip. The beaches are with few exceptions, pretty mediocre. One of the exceptions is Livadia beach situated in a beautiful and fertile valley about 2 km from Chora. The beach in Livadia consists of fine grey sand mixed with gravel that gets very hot in the afternoon. Along the beach are several tavernas and pensions. Livadia beach. Chora and Kastro to the right. Other beaches can be found around the villages of Meza Vathy and Exo Vathy. Just south of Livadia there are three beaches lined after each other, it is possible to go there with a scooter. Kaminakia and Vatses in the south are only reached by beach boat. Livadia beach in the other direction. As you can see, Astypalea is a barren island. 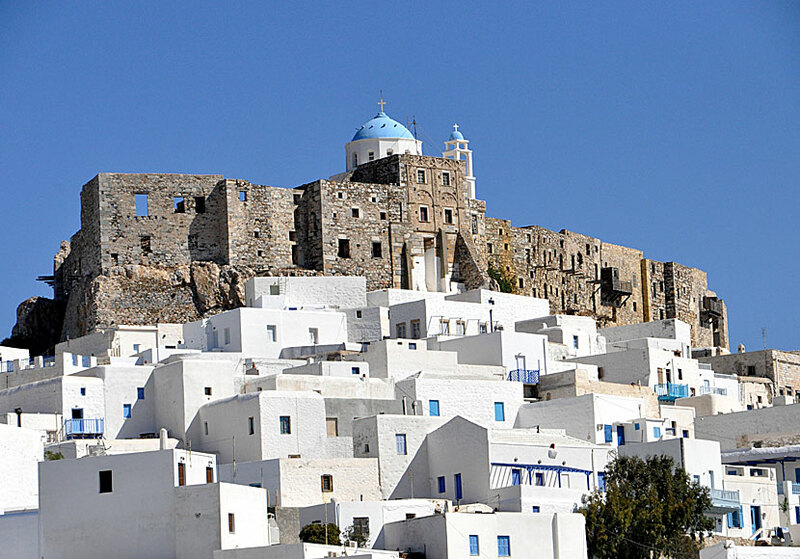 The main attractions of Astypalea are Chora and the fortress Kastro that is impossible to avoid noticing. Kastro watches over both Chora and Pera Gialos. The Kastro was built as a defense against pirates during the Venetian occupation. There used to be some form of Kastro on most islands, many are now destroyed. 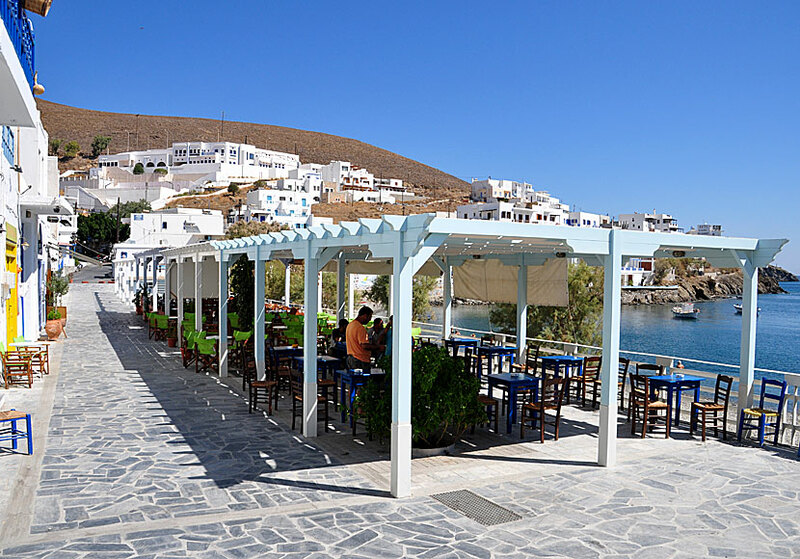 The best preserved are on Antiparos, Folegandros, Kimolos, and here on Astypalea. The Kastro on Astypalea is the most impressive of them. On the day it shines white from sunshine and at night it shines like a diamond in the spotlights. It is really impressive. Today, no one lives inside the Kastro, the last inhabitants moved 1948. It costs nothing more than sweat and tears to enter the Kastro. The views are breathtaking. 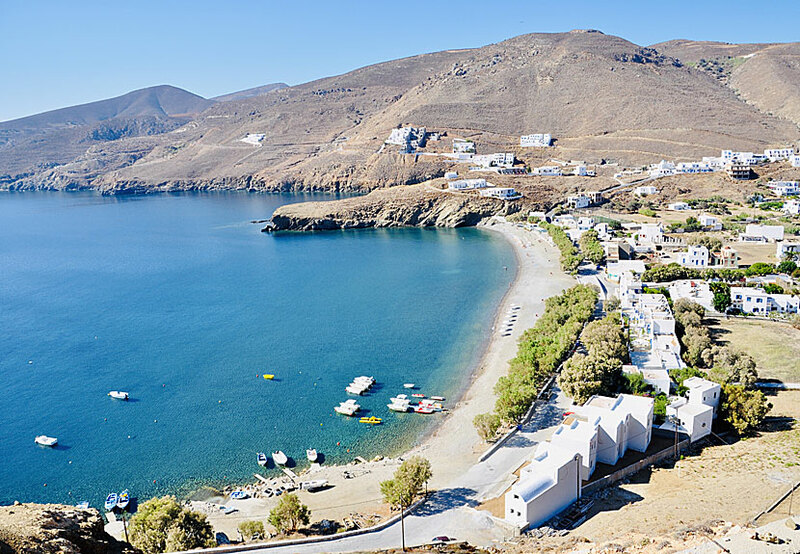 There are a surprising number of pensions and hotels on Astypalea. Most are located in Pera Gialos, but there are quite a lot at Livadia beach, and along the way down to the beach. Where it is best to stay is of course a matter of taste. Personally, I prefer to stay in Pera Gialos where there is the best variety of restaurants and shops. The port is far away, therefore I think it is best to book in advance, and agree with the guest house to be picked up at the port. Aphrodite Studios, Caldera Studio and Korali are three very nice hotels.